This work represents a raindrop; particularly appropriate for Lincoln, with its interests in rain-fed agriculture. It is of fretted stainless steel, cut with a laser to produce multiple cloud images. This is in line with the surface treatment of recent sculptures by Dawson. Although he does smaller intimate works for the home, most of his international commissions are large, often huge geometric structures, usually hung high outside noted buildings, and delicately cut to show images of the natural environment-leaves, flowers etc. One magical effect of these is the shadow pattern cast by side lighting. Strongly represented in New Zealand, Neil is very much in demand internationally, with works world over. Earlier sculptures were often quite simple but nevertheless very clever "tromp l'oeil" with the metalwork being in one plane only, yet portraying a three-dimensional image and catering to Neil's fascination with illusion. In 1993 Neil spent one semester at Lincoln University, when he was Visiting Artist with the Department of Landscape Architecture. During that time he produced "Nor-West Arch"-another "trick of the eye", which used to hang in the sky beside the Forbes Tower. 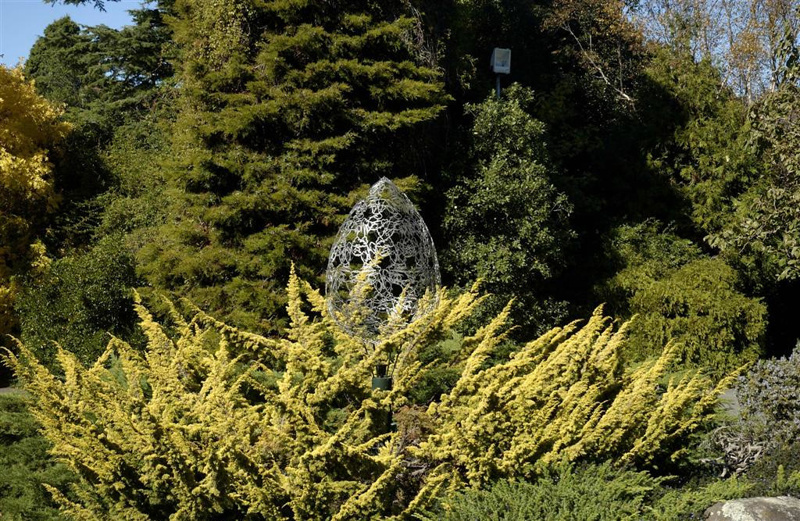 Christchurch is particularly fortunate to have, in the Square the "Chalice", a large 7m high, inverted cone of steel, out of which shapes of native plants have been cut. Seen lit at night this is an awesome work with more than a touch of a shrine about it. - originally written for the Visitors Guide to Artworks, Buildings and Trees on the Lincoln University Campus, by Michael L Smetham, Roy Edwards and Roy Montgomery, 2007.